Nicole's Needlework: Sailing Home Finished! I got Sailing Home finished today! I'm so glad it's done. Now I can get it framed and give it my brother and SIL for my nephew. Well, I've got to get ready to make dinner - meatloaf and mashed potatoes. :) Write later! Stunning! I love the colours of the thread(s). Congrats on the finish! Nicole that is almost as beautiful as your nephew. I love the colors and the threads. This is so beautiful, Nicole. I really really like this sampler. That is so cute! Great job. how pretty & so perfect for a little boy!!!!!!! You finished it! It is so pretty. Those blues look beautiful on the Old Mill Java. I'm sure your nephew and his parents will always treasure it. Congratulations, Nicole ! That turned out beautifully! Beautiful Nicole. And, dinner sounds good too!! Sailing home is beautiful! Congrats on another great finish! The sampler is beautiful, just right for a little boy. Congrats on the finish. This is so lovely. Your brother will love this--what a fantastic present! Thats what we had for dinner :) So yummy. The BBD is just lovely. It's such a wonderful happy design. Can't wait to see how you will frame it. I'm sure it will be wonderful. His work was wonderful and you did in my favorite color "blue." Congratulations for the beautiful work, your blog is lovely. It's so beautiful, Nicole! Your brother and sister-in-law will love it! I hope you show it to us when it's framed before it goes to its new home. Lovely piece. The colors are so pretty. Beautiful! Congrats on the addition to the family. Congratulations on this beautiful finish. It looks so much better thatn on the chart cover! The fabby and the floss are so nice. Nicole, this is a stunning piece. Congratulations on this finish! Oh this is SO pretty, Nicole! I hope to stitch one of these for my first grandchild coming this summer, but since the kids want to wait to know what the baby will be, I am just going to have to wait! Great job! Looks wonderful, Nicole! I'm sure you'll find a lovely frame for it. Beautiful. I'm sure it will be treasured. It's stunning, Nicole. I love it! This is such a sweet piece. The colors are beautiful! Congrats on the finish! It is simply beautiful, Nicole! Well done! Oh my that turned out so lovely! Congrats on the finish. Gee dinner sounded so good, sorry I missed it. LOL! Oh, how stunningly beautiful! Well done, Nicole! I'm thinking of doing the girly one for a friend of mine. 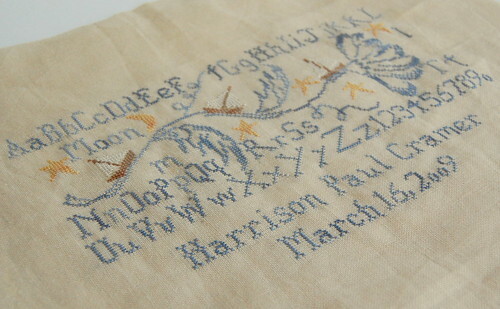 I just love these because they're so different from any birth sampler I have ever seen! I love meatloaf diiner - we always have it with rice, but i have to try it with mashed potatoes, too. that sounds yummy! 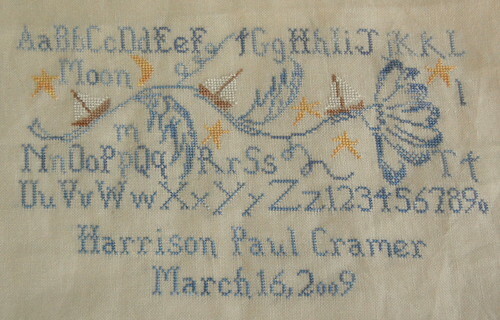 great finish on the birth sampler. I like the colors used. this turned out beautiful. What a nice stitch. Congrats on your finish! It's beautiful. Gorgeous, congrats on the finish! Very nice, Nicole. I'm sure it will be treasured. That is just gorgeous! Wonderful work and I can not wait to see it framed! Nicole this is absolutely beautiful. How pleased you must be with this finish. Wow, this is just gorgeous. Congratulations!